What’s your process from start to finish when working on a painting? It really depends on the type of painting. For the pieces like the CTA project, I try and sketch out the composition on the canvas. I then will block in the main colors. Then shade and add the highlights. Then outline last. I really try and use references as much as possible to make sure my shading looks right. However I do still improvise with my own style. For the abstract pieces, I just lay down the color I have left over from my brush while painting other pictures. I just spread the paint all over with canvas with no specific technique. Eventually the background develops a cool layer/color relationship. From there I create my characters and objects. Shade. Highlight. Outline. Then adjust colors as neede. What inspired the artistic direction in this show? Well I think the artistic directions was in two parts. In regards to the art hanging up, that was all curated by London and Mick Jenkins, both amazing artists in their own right. They are brother and sister who own and operate WeSpace Chicago. I showed them all my art and they chose what they thought fit the best. The title and theme came from me. "In Search of Something More" is an idea I've been thinking about a lot lately. Specifically for me, that something more is my joy. I think a lot of our lives are run by that one thing we are looking for, Things like love, God, fame, inner peace, etc... They influence our decisions and actions. As of late, my uplift art has been a reflection of that. The character on it's journey looking for whatever it's looking for. What songs or artists were you playing the most while painting for the show? I love everything Chicago. That's a lot of what I listen to. Off the top of my head...Cam O'bi (His whole soundcloud), Malcolm London (Right Away Series), Shawnee Dez (Slipped Up), Daryn Alexus (Homesick), and Vic Mensa (Innanetape) were some artists I listened to while painting the pictures hanging at the show. Also Leon Bridges (Coming Home and River), Lianne La Havas (No Room for Doubt Youtube Video), and my Spotify playlist. While working on the painting of the commuters traveling on the train, what were something you learned about them or humans in general? People are willing to be vulnerable, even if you're a complete stranger. Are there any plans in your immediate future? I'm coming out with the 3rd CTA Project very soon and I have a group show coming up at YCA. Other than that, I plan to to step back and really practice my technique and become a better artist. I don't plan to have any shows soon until I really hone my painting skills. When curator and featured artist Dionne Victoria went searching for art that represented people like her at the local museums, she was left with a reminder of slavery and hardship. After years of being told that those are the only stories that would be regarded as “Great”, she decided to take control of the narrative by creating bi-annual Black Love Matters! exhibition through the Butterfly community. 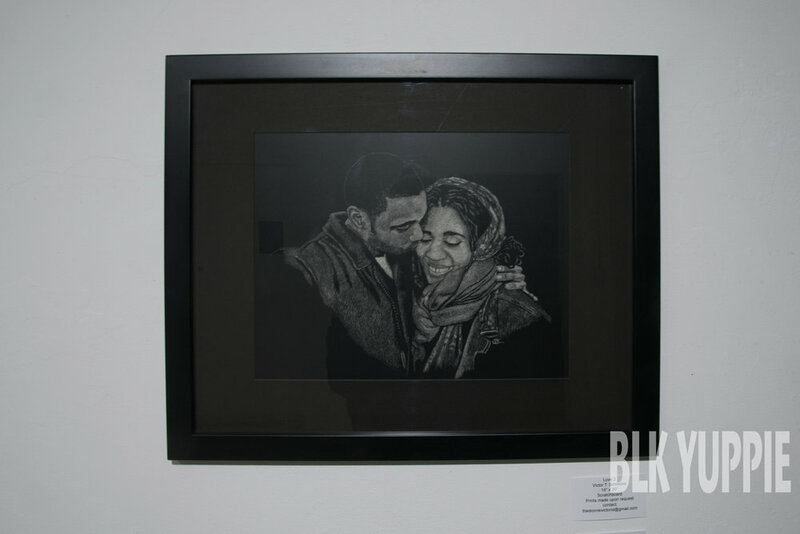 A collection of artists from different race and backgrounds came together last Friday to show their perspective of what love in the black community looks like. 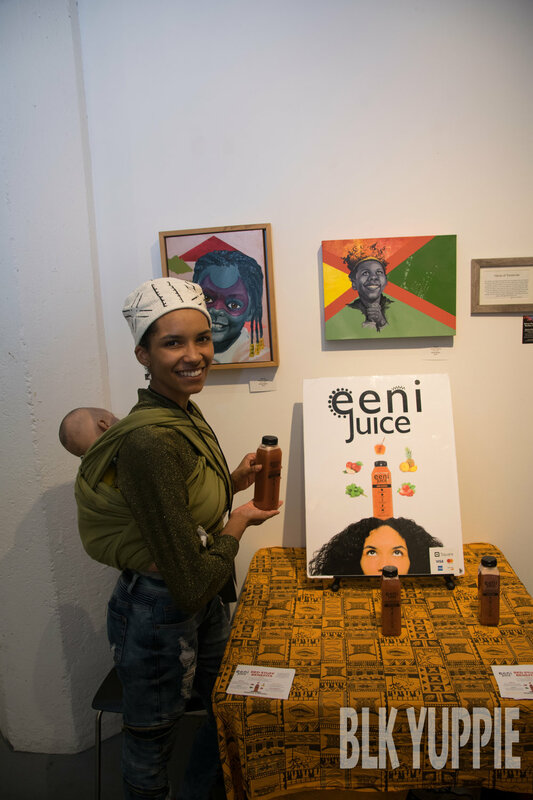 Natural & Organic juice company EENI can be found at all of the dopest pop-ups around the city. 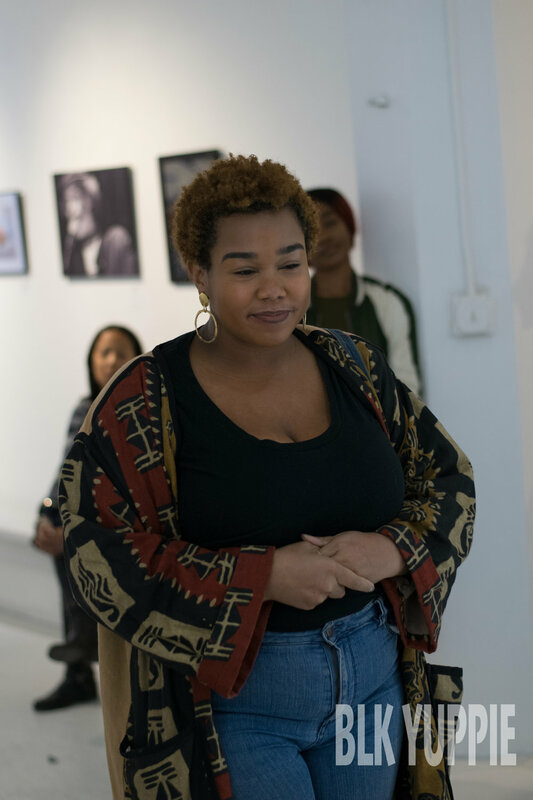 Through spoken word and intimate conversation, Natalie B showed us the three levels of love. B’ Rael gave us the pain of police brutality while keeping the art of Footworking alive. Kwnology reminding us that we all did use to Love H.E.R. by speaking on her love of Chicago. 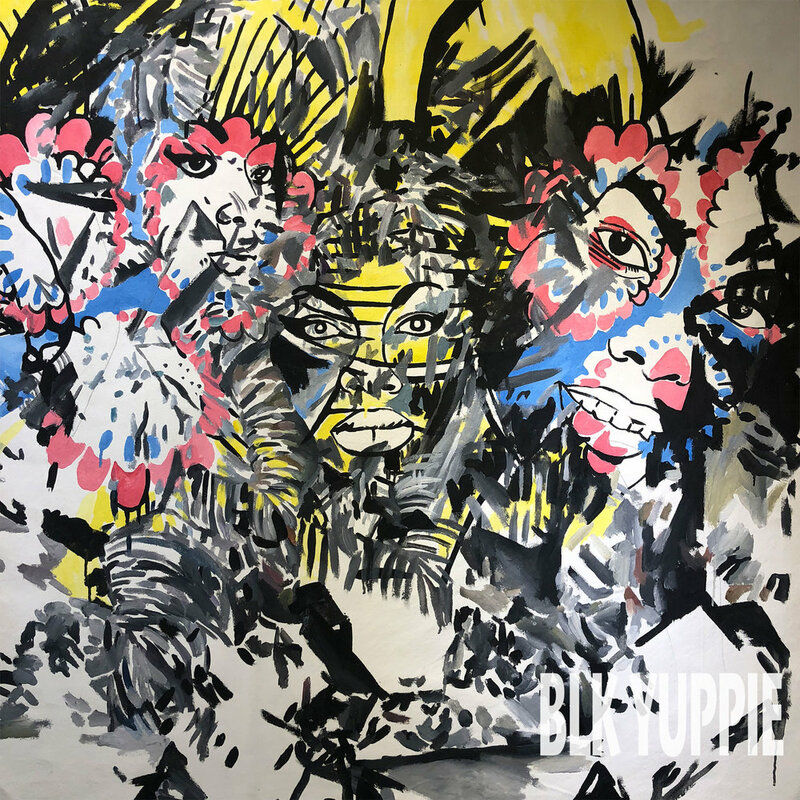 As with any piece of art you see online, it will never do it justice so make sure you check out the full exhibit at the lower level of 1029 W 35th St.
We stopped at Sheena Rose solo exhibition opening reception last Friday at Connect Gallery as our first fall exhibition for the year. Sheena Rose is a contemporary Caribbean artist from Barbados. 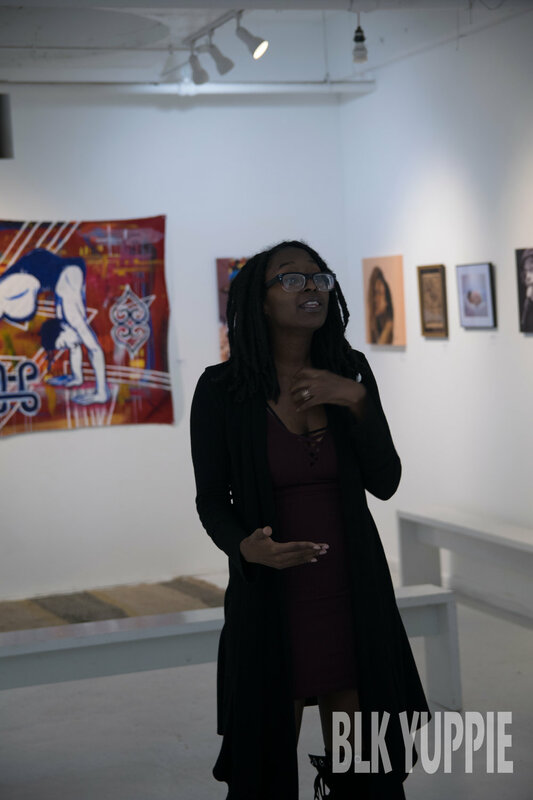 In 2008, Sheena graduated with a BFA degree with Honors at Barbados Community College, and in 2016, she received her Masters in Fine Arts at the University of North Carolina at Greensboro with a Fulbright Scholarship. Sheena works with multimedias such as hand drawn animations, drawings, paintings, performance art, mixed media and new media. Shout out to Rob McKay and Connect Gallery for allowing us to come in there and take pics. 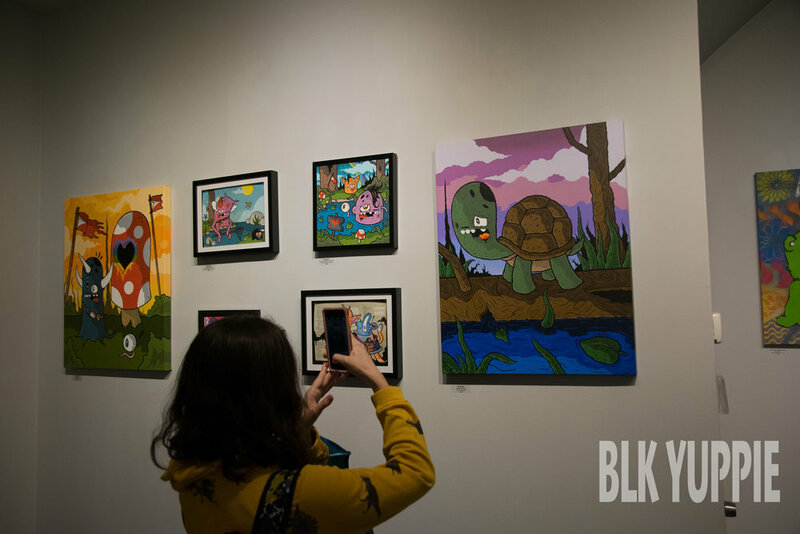 Arguably one of the dopest galleries on the southside of Chicago. You can check out the work until October 26th. Cover Story: From Houston to Chicago, Comedian Mickey Housley speak with us about Jokes and Notes, starting off as a “Clean Comic”, and perservering in the comedy game for almost 10 years. In 2013, Anthony Overton Elementary school closed down and was later purchased by the Washington Park Development Group. Since this beautiful architecture wonder use to be a modern and progressive approach towards education reform, it is now added to the National Register of Historic Places in 2016. 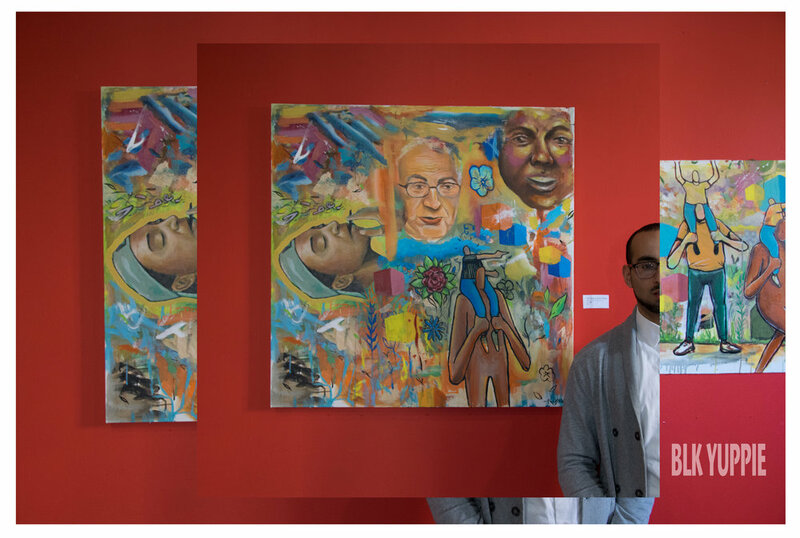 As we’re slowly understanding that in order to fix Chicago, we need to fix the education, local artists have decided to create work that explore the past, present, and future of Overtons that will hopefully bring solutions to our problem. Black Yuppie creator Quest the Legend was invited to show his work for the event but because of the late notice, he wasn’t able to join. He did however felt that he needed to help bring awareness to what Creative Grounds is trying to do for our neighborhoods so he decided to attend as a guest and document the whole experience. After exploring each room, I couldn’t help but to feel this cryptic feeling of emptiness and sadness. Even though each installation gave me a sense of hope for the future of education and how much aware our young students are about what’s happening to their surroundings, you still can’t help but to think about the displaced children that once vacated this location. I leave the images below for your own interpretation but make sure you follow creative grounds to stay up to date on their next projects.